A well designed and installed retaining wall can add function and structure to your garden, often increasing the usable space (especially in sloped yards) by creating a foundation for your landscape. One of the best and most effective solutions to protect your property from soil erosion from excess rain is by building a retaining wall. With the right choice of materials, we can create a stunning hardscape around your garden/lawn that is both visually stunning as well as functional. 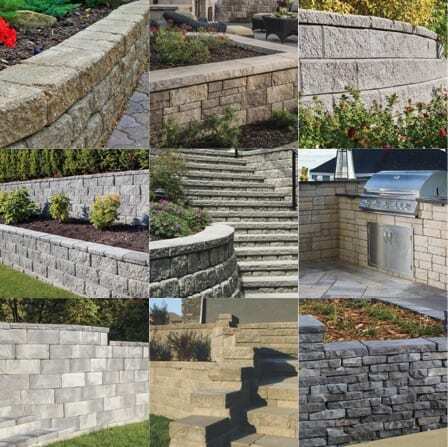 Whether your retaining wall needs require an engineer or not, our certified installers are familiar with the requirements of a variety of retaining wall materials for varying wall heights and install to a standard that exceeds most in the industry. Modular Block Retaining Walls – Comparable in price to poured in place concrete walls with many significant advantages. Modular Block walls now come in many sizes, shapes, textures, and colors to suit almost any outdoor decor. These concrete blocks systems are durable and flexible so do not crack like a poured in place concrete wall as well, they are repairable. The manufactured concrete blocks enable the installation to be precise and to specifications taking all guesswork out of the end product and ensuring a long-lasting product guaranteed not to fail. Natural Rock – Natural rock comes in a great variety of sizes and shapes. And can be very useful and aesthetic in informal settings while a formal wall can be created using rock specifically quarried for the purpose. 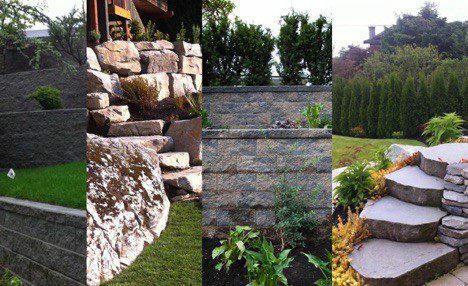 Natural rock walls have the most significant variance in appearance and price, ranging from a rockery (loosely fitted rock on a slope) perhaps costing less than most alternatives to tightly fitted feature walls that can be among the most expensive. The biggest drawback of using rock is meeting expectations with the budget. Living Walls – There are different products on the market now that enable us to build an engineered wall using a “sandbag” method. The bags are filled with sand and organic soil so that the wall can be planted creating a much softer and natural appearing retaining wall. These retaining walls are often used in environmentally sensitive areas or where there is insufficient access. Timber Walls – Cost-effective alternative for the short term. Timber walls can generally be installed for less money than the other options; but over time, even pressure treated timbers will be subject to rot and decay. Often a popular choice for raised planters and vegetable gardens. Please note: when using timbers for vegetable gardens, it is best to avoid pressure treated products as they contain many toxins. Natural cedar or organic preservatives are a better choice.